I LOVE turkeys! AND I love to decorate with turkeys for Thanksgiving! I mean aren't they just the cutest!? 1, 1x4 cut into 20" pieces, for the feathers, your last piece will only be about 16 inches and that's ok! This is the fabric I chose. I got 1/4 yard of each from Hobby Lobby. Start by Mod Podging the fabric to each 1/4 board for the feathers. Apply Mod Podge to the board. Put the fabric on top of the board. Flip the board over and either trim the excess or fold it over and staple it with the staple gun. Then put more Mod Podge over the top of the fabric. Stain the wooden circle and the long rectange dark walnut. Be sure to wear the gloves and use a rag to spread the stain evenly. Paint one of the squares black. Arrange your feathers on the back of the circle and nail them in. Glue the head and hat to the front with wood glue. 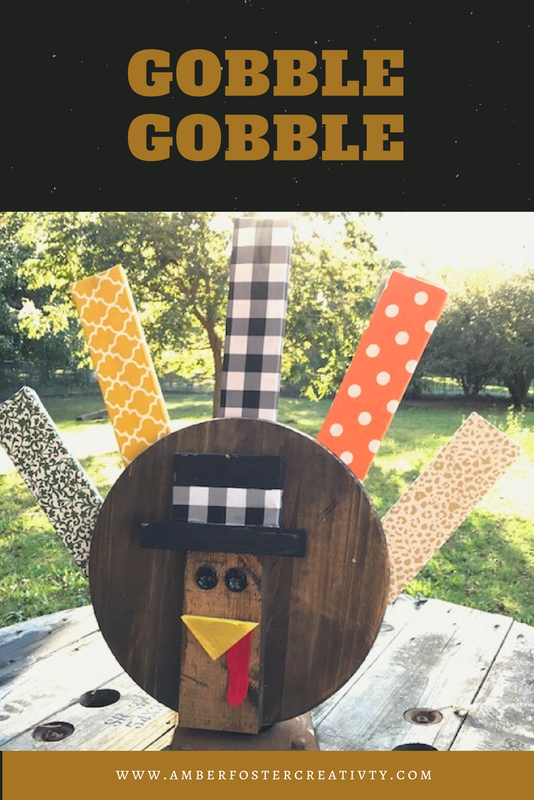 Cut out your gobble from the red felt and glue it and the beak and the button eyes on. Put some glue on the other square, the kickstand and glue it to the back. I also attached a little scrap of fabric for his hat with the Mod Podge and then allow everything to dry before you stand him up! Ta da! Watch me demo this project live on Hometalk's facebook page, Monday, October 30 at 2pm!